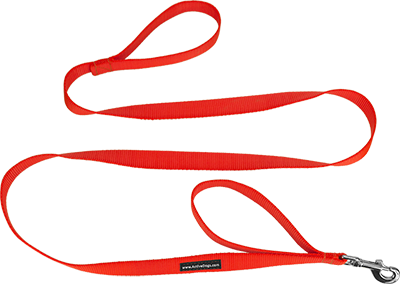 This leash is made of heavyweight, blaze orange, nylon webbing. There are looped handles on each end of the leash to give the handler added control of the dog. The two handles give you the option of keeping the dog close or letting out the line. Both ends are box stitched for added strength. The leash has a metal swivel bolt snap.